Other mistake: When the children arrive in Blackpool, Emma tells Jake that loop entrances can be anywhere and that "the one in London is in a subway tunnel", but on the map of all the loops they were viewing previously inside the boat, there was no marking of a loop in London. Other mistake: When the Hollow is approaching Miss Peregrine by the shore, it doesn't cast a shadow when it's invisible. But as seen several other times in the movie, Hollows cast shadows when they are invisible. 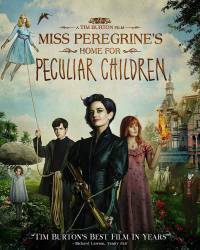 Plot hole: At the end, Jake utilizes multiple Loops to reach September 4th, 1943, the date from which Miss Peregrine's children impossibly entered another Loop set in the winter at the beginning of 2016. The closest date prior to this was in 1942, from when Jake waits for September 4th 1943 to arrive. However, having entered a Loop in 1942, he would have been unable to reach 1943 because he'd be stuck living the same day in 1942 over and over. Suggested correction: Is it possible he left the loop while in 1942? The movie doesn't directly address that idea. It does address this, actually. He'd have reentered the true time period upon exiting the loop. I suppose he could have prevented the local ymbryne who created the loop from resetting it, but if he did, he'd have doomed all those peculiars in the process. Not something Jake would do. Trivia: Tim Burton makes a cameo in the fun park scene. He is the man with black frizzy hair and sunglasses on a ride that the hollow smashes into in a close-up. Emma Bloom: If I show you the rest you have to promise not to run away. Emma Bloom: You don't have to make us feel safe, because you've made us feel brave. Question: How is Emma sitting on the horse and cart when she is lighter than air? I have watched the movie a few times and cannot see anything like a belt around her waist, but any other time she is sitting, she has been seen buckled down. Chosen answer: At several points throughout the film, there are instances where her powers of air are used only as a plot device, so the extent of her powers is somewhat unknown. Therefore, it is possible she is able to make herself sit on the cart without floating, but other times isn't. Answer: This is a movie mistake because when she's at dinner, she has to wear a buckle to hold her down. And I don't see why she wouldn't be wearing one on the carriage too.